A desert environment that resembles Fruita with washes/arroyos and a mountain bike play area. 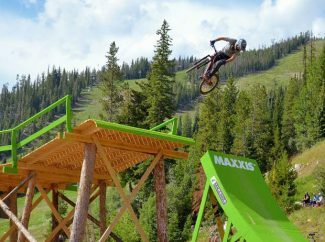 This is a “cool” local loop with great riding in a desert environment. Ride through draws with alternate lines and a bike play area. This route has blue markers on posts. Start at the Kremmling Town Square and head north on 3rd St. Take a quick right on Kinsey, left on 9th. At .75 miles, take a right on Jackson, right on 21st St., left on Kinsey, At 1.5 miles, turn left on CR 22. At 2.8 miles, take a left CR 224. At 3.5 miles, take a right on BLM-WS0240 to OHV Open Area Parking (alternate trailhead). At 4.2 miles, turn right on BLM 66. At 4.46 miles, turn right on BLM 101/2242.1. At 5.2 miles, turn right on WS0236. At 5.8 miles, turn right on 105. At 5.83 miles, turn right on BLM 123. At 6.57 miles, turn left on Sandtrap Loop. At 7.1 miles, turn right for counter clockwise loop. At 9.3 miles, turn left on BLM 551. At 9.8 miles, turn right on CR 22 and head back towards town. Turn right on Kinsey, right on 21st, left at Jackson Ave. Left on 9th St. Right on Kinsey. Left on 3rd St. and return to Kremmling Town Square. PLEASE NOTE: the seasonal closure on these trails until April 15. 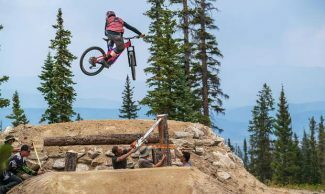 Fun features and new flowy trails built by the town of Winter Park. A close to town (Winter Park) ride with lots of single track. Rock and wood features for bonus fun. Start at Winter Park Information Center and cross Hwy. 40 towards McDonald’s. Go straight, then turn right on Lion’s Gate Drive. Left onto sidewalk/path at Kings Crossing Rd. After crossing railroad tracks, right onto Leland Creek dirt path. At first switchback, right for Sundog. Right for a short bit on Sunset Pink, then right onto Akima’s Way. Left onto WTB which eventually intersects with D4. Right on D4. Just before popping out onto FS 159 road, Leap Frog single track is on your left. Ride Leap Frog until left uphill at D3. At intersection with D4 stay right on D3. Right at Sunset Pink. Stay right for all remaining intersections until you come out on CR 148 dirt road. Left on CR 148/Vasquez Rd to U.S. Highway 40. Left at stop light to return to Winter Park Info Center. Historic and above treeline with a hike option. Big climbing on historic Corona Pass. Riding above treeline on Rogers. Lots of bumpy downhill and abundant single track. Only for those with a hearty soul and strong legs. Tops out at 11,900 feet. Start at Winter Park Public Works Trailhead south of Winter Park. Left onto paved Fraser River Trail. Paved trail enters parking lot at Telemark Drive. Go right, then left on Winter Park Drive. Turn left at intersection with road gates. Cross US Hwy 40 at stop light and ride up Lakota Trail road until you can merge right on Arrow Trail road. Right on FS 128 dirt road until you come to Buck Creek jeep road on the left. Right on FS 149/Corona Pass Rd. dirt road and climb until you reach the top of the old railroad trestle. Directly across from the trestle is Rogers Pass single track. Ride this as an out and back. Afterwards, head back down FS 149/Corona Pass Rd. Right at Broken Thumb two track. Cross FS 128 dirt road to Twisted Ankle single track. At drop out on South Fork Loop, go right. Straight at intersection for Burnout Loop. Right on the two track for recommended counter-clockwise ride of this lollipop loop. Stay on main two track always keeping left until sign to return right to South Fork. At intersection after beaver ponds, right to cross bridge, then left on Idlewild single track. Right on Ditch Trail until Homestead two track and go left. Left again on Crosstrails single track. Right onto Winterwoods. Merge left onto Serendipity. Continue to Yankee Doodle and go right downhill. Left at Meadow single track. Straight on Ski Idlewild Road into town. Left on side walk to ride Fraser River Trail back to Winter Park Public Works. Fun flowy new trail with alternative rock lines for added difficulty. 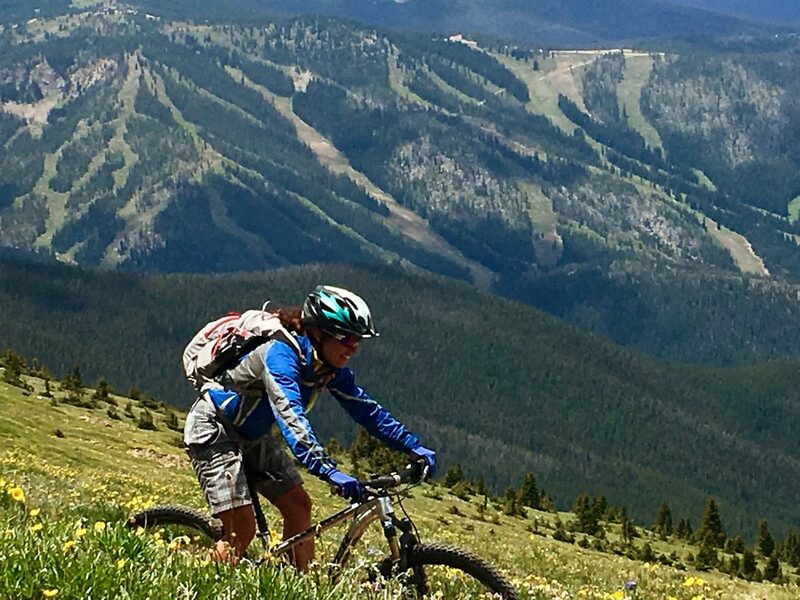 A mostly single track ride covering trails west of the Town of Winter Park. Fun optional wooden features. Start at Winter Park Info Center and cross Hwy 40 towards McDonald’s. Go straight then turn left on Lion’s Gate Drive. Right onto Vasquez Road. After road turns to dirt, take a left onto the newly redesigned Twin Bridges single track. Right onto Blue Sky. You’ll pop out onto FS 897.0 dirt road. Veer right/straight until road takes you right/down over creek and then right on Vasquez Rd/FS 148 to Take D’Leap on left. Ride until right onto Leap Frog. Left for a short stretch on D4 then right on D3. Right at Sunset Pink. Near bottom, after big rock, left to Sundog, which will pop you out at the bottom of Leland Creek. Continue downhill and back towards town on Kings Crossing Rd. Left to cross railroad tracks. Right at US Hwy 40 and back to Winter Park Information Center. Tough climb followed by forested flow downhill. Lots of single track starting with a challenging climb up to the old town of Arrow on Corona Pass. Then a fun downhill followed by rolling trails through a new growth forest. Start at Winter Park Information Center and head east on Rendezvous Way. Left on Ski Idlewild Road. Ride the road until you see an old white fence on the right. Just after that you will see Meadow Trail on your right. Turn right at Yankee Doodle single track after small rock bridge. Climbing approximately 3 miles you will cross CR 80v/Corona Pass Rd twice before you get to the top and Arrow single track. Descend until you take a right on South Fork Loop single track. Straight at intersection for Burnout Loop. Right on the two track for recommended counter-clockwise ride of this lollipop loop. Stay on main two track always keeping left until sign to return right to South Fork. At intersection after beaver ponds, right to cross bridge. Quick left onto Idlewild single track. Left on Ditch single track. Right on South Fork single track before bridge. Climb up to left for Whoops single track. Left on Serendipity single track until it rejoins Yankee Doodle. Turn right and descend to Meadow then left onto Idlewild Road dirt road and back to Winter Park Info Center. Beautiful wildflower ride to a high meadow with side trip to Strawberry Lake. High quality, beautiful single and double track winding through alpine valleys and meadows. A great ride if you are seeking seclusion. Excellent wildflower factor. Start at the parking area for the High Lonesome Hut on CR 84 road approximately 4 miles from Hwy. 40 outside of Tabernash. Go around gate and straight on the double track towards the hut. At the hut, stay left and follow double track until single log bridge over creek where the ride turns to single track. Left at Caribou. Ride past Strawberry West. Left at Strawberry Creek. Left on Strawberry West which will circle around until you rejoin Caribou. Right on Caribou to return right to Strawberry back past the hut and on to the parking area. NOTE: There are several trails in this area with “Strawberry” as part of their name. Stay true to the trails listed in this description to avoid getting lost. Want more? 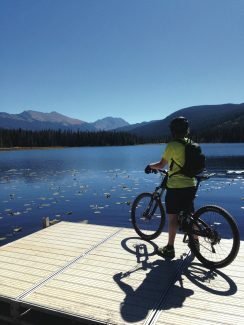 Check out the 2018 Explore Grand Bike Guide, available on newsstands around Grand County, which details many more of the county’s best bike routes.